Transfer agents often have the most current information on old stock certificates. The surge in technology in the 1990s and the first decade of the 2000s led to many casualties among traditional business practices, including the practice of issuing physical stock certificates. In 2001, the New York Stock Exchange ceased requiring physical stock certificates, allowing issuing companies to spend less time and money in their creation, distribution and tracking. However, a small number of companies continue to issue physical stock certificates, providing shareholders with a measure of security from hackers and other attacks on companies. Scripophily.net is an online dealer in stock certificates that will research your certificate’s status for a small fee that is waived if no results are found. You can also refer to the "Financial Stock Guide Service," a book that lists defunct companies and transfer agents. Other sources include the treasurer of the state in which the company was incorporated. Provide documentation that ownership has been transferred or assigned to you, either in the form of a will, trust document or other document, to the transfer agent, who can transfer legal possession of the certificate to your brokerage account. Ideally, you should have a paper trail connecting you to previous holders of the certificate. Sometimes, the issuing company acts as its own transfer agent. You can also visit the website of the Securities Transfer Association, which maintains a long list of its member transfer agents, and, if necessary, conduct research through the Depository Trust & Clearing Corporation. Your ultimate goal should be to effect the transfer of the stock to your brokerage account. The transfer agent should be able to assist you in reconciling the value of the certificate with corporate actions that would have caused changes to face value or the number of shares owned, such as splits and shareholder recapitalizations. If the transfer agent no longer exists, contact the state agency that handles incorporations in the state in which the company was formed. Provide documentation to your broker, who is responsible for keeping account values current and therefore can do much of the necessary research. If the certificate says “specimen” where the stockholder’s name should be, the certificate has no legal value. 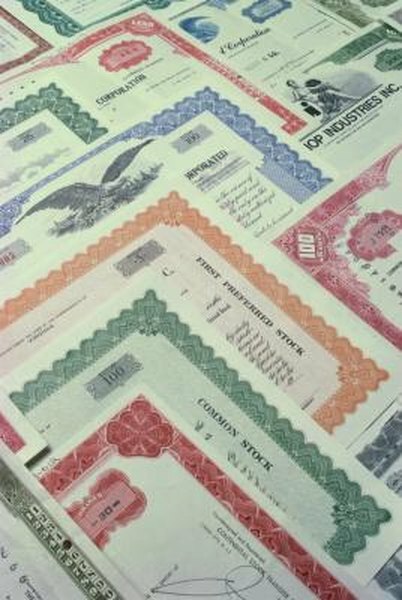 The International Bond and Share Society regularly holds auctions, which creates a market for old stock certificates. You can look for comparable transactions listed in the auction results published online. If the legal value of the stock certificate is zero, it may still be of value due to demand generated by collectors of old stock certificates. Old certificates can be worth anywhere from $10 to $10,000, although most samples will fall in the lower end of the range. Collectors value certificates for the history of the issuing companies and also as art. Certificates often feature beautiful engravings running along their edges and detailed etchings associated with the issuing company’s industry. Decorative quality, historical significance, autographs, age, condition and whether the shares were actually issued are the key value drivers of old stock certificates. The Securities Transfer Association, Inc.: Who Is the STA?